RebelEconomist comes late to this debate, but since it appears to remain active, his views may yet be useful. For what it is worth, RebelEconomist agrees with Hans Werner Sinn's conclusions that the European Central Bank (ECB) is conducting a stealth bailout of the peripheral eurozone economies and that this bailout disadvantages German borrowers, although Sinn's explanation could have been better. The key point, which none of the articles on this subject read by RebelEconomist has made explicit however, is that, because the ECB has set apparently more lenient loan collateral standards than the market for the types of assets that peripheral countries' banks tend to hold, the eurosystem is effectively lending to these banks at a subsidised interest rate, meaning that the eurosystem has become the marginal lender that finances these countries' net euro payment outflows. At the very least, Sinn deserves kudos for raising to public attention such an arcane but significant issue, which had not occurred to RebelEconomist despite his interest in central banking. In order to judge the arguments made by Sinn and his detractors, it is necessary to appreciate how a cross-border euro payment directly and indirectly affects the balance sheets of the various financial institutions involved. This may be seen by tracing the impact of a typical cross-border payment through the eurozone banking system. Since Sinn was criticised for associating these effects with current account imbalances, I would offer instead a simplified version of his example of an Irish farmer buying a German tractor, in which the payment is exactly the same as it would be for a capital account transaction arranged by the farmer to move his deposit from an Irish bank of questionable creditworthiness to a safer German bank. Suppose that instead of needing to borrow, the Irish farmer, being flush with EU milk subsidies, has enough cash in his bank account to pay for the tractor outright, and just writes a cheque in favour of the German tractor dealer (in the case of deposit flight, the farmer would open a German bank account and write himself a cheque). This transaction would result in the farmer's Irish bank current account being drawn down and the same sum credited to the tractor dealer's German bank current account, while the Irish bank would make a payment to the German bank via the interbank fund transfer system that settles in their respective current accounts at their central bank. In most monetary areas, both banks would hold their current accounts at the same central bank, and settlement would involve a simple reallocation of current account credit from the payer bank to the payee bank, with no change in the nature of the central bank's liabilities. In a regionally distributed central bank system, however, like the Federal Reserve System or the Eurosystem, banks deal only with their regional central bank. In this case, the counterpart of the decrease in the payer bank's current account balance, which represents a liability of its regional central bank, is a negative contribution to that central bank's cumulative position with the rest of the central bank system, while the counterpart of the increase in the payee bank's current account balance is a credit to its own regional central bank's cumulative relative position. In the Eurosystem, these relative positions are recorded as balances with the ECB in the interbank fund transfer system TARGET2 (Trans European Automated Real time Gross settlement Express Transfer system 2). In the absence of an existing cumulative position, the farmer's tractor purchase would generate a TARGET2 deficit at the Central Bank of Ireland and a TARGET2 surplus at the Bundesbank. Because these bank current, or reserve, accounts at their central bank play a vital role in monetary policy operations, how banks accommodate interbank payments depends on how monetary policy is conducted in their currency area. Since these indirect effects are central to the debate stirred up by Sinn, an understanding of monetary policy operations is necessary to evaluate the arguments, so some principles and details relevant to the present discussion are explained here. Readers who believe that they are already familiar with monetary policy operations may skip the following four paragraphs. For a more complete non-technical explanation, refer to the first half or so of my "Easing understanding" post. Positive balances in banks' current accounts at the central bank represent a secure and liquid asset and are known as "reserves". However, any interest rate paid on reserves is typically relatively low, and is not always paid on the whole balance. Banks therefore usually try to minimise their holding of reserves, subject to a constraint provided either by a ban on overdrafts or by a requirement to hold an amount of reserves representing some minimum fraction (in the eurozone, 2%) of deposits for regulatory reasons, leading banks to aim to hold on average a slightly higher level of reserves than the constraint to allow for the unpredictability of payment flows. Monetary policy ensures that the aggregate stock of reserves held by the banks is as large as needed, and the banks distribute this stock between themselves via a money market wherein banks with surplus reserves lend to those with a shortage, typically for one day at a time. As any transaction between the banks and the central bank is also settled with reserves, the central bank can use designated transactions to adjust the overall stock of reserves. And because there is, other things equal, a one-to-one correspondence between the stock of reserves and the market-clearing interest rate in the money market (assuming a downward sloping reserves demand curve), the implication is that the central bank can also control that interest rate, and by arbitrage, short-term interest rates generally. In practice of course, central banks generally choose to explicitly set the interest rate rather than the quantity of reserves, as this approach best accommodates the impact of non-policy variations in reserves supply and demand, but note that this equivalence means that it is immaterial to the present discussion whether the central bank uses its transactions to set the stock of reserves or a money market interest rate (contrary to what some of Sinn's critics have argued). The type of transaction that central banks normally use for marginal adjustment of monetary policy is to trade debt; in particular to offer to lend to, or occasionally borrow from, the money market at a prescribed policy interest rate. These are known as open market operations (OMOs). In the eurozone, monetary policy is set by the ECB as the monetary area's central authority, but monetary policy operations are conducted by the national central banks. The policy interest rate is the ECB refinancing rate, charged on week-long loans offered in the ECB's weekly main refinancing operation. Naturally, if there are significant disparities in creditworthiness between banks, the money market may make allowance for this by requiring less creditworthy borrowers to pay a higher interest rate to compensate lenders for the greater risk of loss. Alternatively, loans may be secured in the form of repurchase agreements (repos) to practically eliminate credit risk. To ensure access to such loans as needed, banks tend to hold some debt securities which are readily acceptable as repo collateral, notably government and government-guaranteed bonds. In a repo, the lender's objective is to take sufficient collateral to make the joint probability of the borrower defaulting and the collateral then being worth less than the value of the loan negligible. It follows that more collateral should be required if the value of the collateral offered is volatile and also that collateral with value that is positively correlated with the fortunes of the borrower is inferior. The conventional way of arranging this is to match the value of the loan with an amount of collateral valued using its market price reduced by some percentage known as a "haircut" specified for that type of collateral, with larger haircuts for collateral with a more volatile market price. Central bank lending is normally collateralised, allowing the central bank to set monetary policy by offering loans at a single rate to all counterparties without discrimination. Although the importance of monetary policy means that OMOs tend to attract the most attention, the archetypal transaction between the central bank and banks is actually the supply of banknotes. While the aggregate stock of reserves is always greater than zero, in normal market conditions banknotes are by far the largest liability on the central bank's balance sheet, as banks draw down their reserves to pay for banknotes to meet customer demand. This demand for banknotes tends to be fairly stable, typically growing roughly in line with nominal economic activity. The result is that the central bank is structurally a net lender to the money market, regularly renewing its loans as they mature, which provides frequent opportunities to adjust interest rates. Simply renewing less than the full amount of loans maturing would usually be sufficient to adjust money market interest rates upwards; only rarely, between such opportunities, might the central banks need to borrow in the money market to adjust interest rates. As will be explained later, it is this structural central bank position as a lender to the money market that leads Sinn to argue that the size of the "stealth bailout" is limited, on the presumption that the ECB would be reluctant to become a large routine money market borrower. The reader should now be in a position to appreciate the indirect effects of the payment generated by the Irish farmer's tractor purchase from Germany. Assuming that the Irish bank had been managing its balance sheet to minimise its reserves holdings, in the absence of any other flows, the payment would leave the Irish bank with less reserves than it needs, because the drain on its reserves is equal to the contraction in its demand deposits and a bank's holding of reserves is typically a fraction of its deposits. The Irish bank therefore might be expected to borrow in the money market to replenish its reserves. The German bank, meanwhile, would be left with excess reserves. In the eurozone, although interest is paid on officially required reserves, no interest is paid on amounts in excess of this; the ECB does provide an overnight deposit facility, but this is intended for emergency use and, at present (since 13 May 2009), yields ¾% less than the refinancing rate. The German bank therefore might be expected to lend reserves in the money market to earn a return on its excess holding. Note, however, that the sizes of the Irish bank's shortage of reserves and the German bank's surplus, though still equal, are a little less than the value of the tractor, because the Irish bank has lost deposits and therefore needs fractionally less reserves than before, while the German bank has gained deposits and therefore needs fractionally more reserves. Ideally, it might be expected that a bid for funds by the Irish bank at a slightly higher interest rate than generally prevailing in the money market (assuming, for the sake of argument, that money market loans are secured) reflecting its need for reserves, and an offer of funds by the German bank at a slightly lower interest rate reflecting its excess reserves, would be sufficient to ensure that the money market rebalances via a loan from the German bank to the Irish bank. In that case, the payments imbalance arising from the initial transaction would be largely offset by the opposite payment imbalance arising from the subsequent cross-border loan (note that interbank deposits are not subject to reserve requirements), without involving the central bank. From an Irish point of view, the contribution of the tractor import towards a current account deficit would be financed by a capital account surplus in the form of a private sector loan from Germany. Moreover, the contribution of the initial transaction to the Irish and German TARGET2 balances would also be largely reversed. Since the onset of the financial crisis, however, eurozone money market conditions have not been ideal. The creditworthiness of Irish banks was in question right from the beginning, meaning that their money market counterparties became extra careful to ensure that loans to them were well collateralised. In an attempt to reassure lenders to Irish banks and forestall deposit flight, the Irish government fully guaranteed Irish bank liabilities. Naturally, this undermined the creditworthiness of the Irish state itself, initiating a series of downgrades by the credit rating agencies which prompted the money market to require larger haircuts on Irish government and government-guaranteed bonds pledged as repo collateral. Unfortunately, despite the progress towards an integrated eurozone capital market, there is still a home bias in banks' bond holdings in favour of their own country's government and government-guaranteed bonds. For Irish banks, this has meant that the main repo collateral that they are able to provide is not only less valued in the money market generally, but also less acceptable from them in particular, because its credit risk is positively correlated with their own. For whatever reason, the ECB treated the financial crisis as a liquidity problem, and chose to continue accepting Irish government and government-guaranteed debt as collateral on much the same terms as before, as if private sector concern about Irish creditworthiness was exaggerated. The result has been that, for any given refinancing rate, the ECB is the least demanding lender in the eurozone money market in terms of collateral requirements to Irish banks. Irish banks have therefore made heavy use of ECB refinancing operations to replace deposits drawn down either by payments for net imports like tractors, or by capital flight. And in the face of this removal from the money market of a natural borrower of their excess reserves, German banks have instead tended to run down their excess reserves by not fully renewing maturing ECB loans. Consequently, TARGET2 payments from Ireland to Germany have on the whole not been offset by payments of loan capital in the opposite direction, implying a growing Irish TARGET2 liability and a growing German TARGET2 claim. Of course, Irish-German transactions are just one example; the same process has led to generally negative contributions to TARGET2 balances in other peripheral eurozone countries with relatively poor bank and state creditworthiness, notably Greece and Portugal, and generally positive contributions to TARGET2 balances in other countries with payments surpluses such as Luxembourg (which, for its size, has a large banking industry) and the Netherlands. In the absence of a full recovery from the financial crisis, this has led over time to the large TARGET2 imbalances highlighted by Hans Werner Sinn. By offering payment deficit countries' banks loans on terms that do not, if market expectations are rational, fully reflect their higher credit risk, the ECB is effectively subsidising payment deficit countries' borrowing and, since the ECB also provides an alternative outlet for the increases in reserves generated by payment surpluses in other countries, the ECB has become a kind of central counterparty for the eurozone money market, intermediating many of its cross-border loans. The home bias of banks' bond holdings means that to some extent these ECB-intermediated loans are also indirectly funding payment deficit country governments, which also find it difficult to borrow in the international capital market at acceptable interest rates because of their own perceived poor creditworthiness. As Sinn and other commentators on this issue have noted, interest at the ECB refinancing rate is payable on TARGET2 liabilities and paid on TARGET2 claims, but this is should not simply presumed to be the consolidated national (ie public sector, including the central bank, plus private sector) return for the countries involved. The designers of European monetary union were scrupulous to ensure that the revenue derived from supplying the monetary base (ie reserves plus banknotes) is pooled and shared out between the national central banks following an agreed formula, rather than according to where banks choose to be formally established (and hence which national central bank they deal with), and the geographical vagaries of the demand for banknotes. According to Article 32 of the Statute on the European System of Central Banks and the European Central Bank, the sum of the national central banks' "monetary income" (ie seigniorage) derived from "assets held against notes in circulation and deposit liabilities to credit institutions", less interest paid on reserves and operating costs, is "allocated to the national central banks in proportion to their paid up shares in the capital of the European Central Bank" (ie the "capital key"). For the purposes of this redistribution, the national central banks are required to "earmark" their monetary assets and liabilities according to ECB instructions which specify that positive and negative TARGET2 balances should be counted as monetary assets and liabilities respectively. The monetary income received by a national central bank is therefore independent of the size of its own TARGET2 balance and the interest rate on that balance. In fact, the consolidated national returns on payment imbalances derive from the way in which they are accommodated by private sector banks. Because the payment deficit bank and the payment surplus bank reset their reserves position by borrowing more and less respectively in the ECB refinancing operations, the return to their adjustments is indeed the refinancing rate. As explained above, however, the size of these adjustments is fractionally smaller than the size of the TARGET2 balances because of reserve requirements. Although the payment deficit countries may pay the same interest rate on their ECB-intermediated borrowing as the payment surplus countries earn on their ECB-intermediated lending, the poorer creditworthiness of the payment deficit countries means that, for them, the ECB refinancing rate is lower in risk-adjusted terms. In the absence of any major bank defaults in the payment deficit countries so far, the subsidy provided by the ECB has been in terms of the expected cost of the credit risk it is bearing without compensation. It is therefore important to know where that risk ultimately lies. As now seems to be well understood by all the participants in this discussion (if it ever was misunderstood), because any losses sustained on ECB OMOs are, like the revenue they raise, shared between eurozone countries according to the capital key, the subsidy is effectively provided by the whole eurozone rather than just the payment surplus countries like Germany. In practice, however, payment surplus countries' share of any losses is likely to be slightly higher than their capital key, because in the event of a major loss, the most vulnerable payment deficit countries might well be unable to bear their share of loss without triggering their own default. Does the present configuration of TARGET2 balances represent the "ECB's stealth bailout" of the payment deficit countries as Sinn contends? Though a bit polemic, the description is not unreasonable. Firstly, ECB lending is shielding those countries from the full market cost of their accumulated payments deficits. Without ECB lending, to cover its payment deficit in the eurozone money market a country like Ireland would have to sell assets to foreigners at whatever price can be obtained, such as long-term debt or even gold reserves as suggested by Sinn, either to generate incoming euro payments or to raise money to buy safer collateral to support its money market borrowing. This effective increase in the interest rates faced by that payment deficit country would be expected to reduce its domestic demand, for instance for tractor imports, and thereby choke off its payment deficit. And the present ECB policy is not simply a case of monetary easing in response to overall eurozone economic conditions helping the weakest regions most. Because the ECB is more willing to accept the payment deficit countries' government and government-guaranteed debt as loan collateral than the market, and because such debt tends to be disproportionately held by domestic banks, the ECB is effectively charging these banks a preferential risk-adjusted interest rate, in violation of (at least the spirit of) the principle that "the Eurosystem’s monetary policy operations are executed under uniform terms and conditions in all Member States", as stated in Chapter 1 of the Guideline of the European Central Bank. Secondly, while probably not deliberately so, this is also arguably a stealth bailout, because it derives from a technical decision to relax the collateral standards ostensibly for all OMO counterparties rather than accept the implications of lower credit ratings, and the details of how the bailout works are manifestly (ie judging by the protracted debate raised by Sinn) difficult to understand. Sinn is also correct that the diversion of ECB refinancing towards payment deficit countries is constraining credit creation in Germany. German banks are not constrained in their access to as much base money as they want at the ECB refinancing rate. However, this interest rate is set to meet an inflation objective for the whole eurozone, so to the extent that the relaxation of the ECB collateral rules marginally eases monetary policy in the payment deficit countries, monetary policy must be marginally tighter elsewhere. In other words, the refinancing rate is set higher than it would be if no collateral concessions were made to payment deficit countries. This, given the one-to-one correspondence between the money market interest rate and the stock of reserves, implies less credit creation in Germany. However, considering the present divergence of the strength of economic activity between the payment surplus countries like Germany and the payment deficit countries like Ireland, somewhat tighter monetary policy in the payment surplus countries may well be appropriate. And as Sinn argues, the size of the stock of ECB refinancing does constitute a restraint on the total size of the TARGET2 deficits. Once the payment surplus country banks have paid down their entire initial share of the stock of ECB refinancing (the liability counterpart to their required reserves then being customer deposits only), it ceases to be possible for them to invest the reserves inflow from payment deficit countries any further in this way. Although the ECB's overnight deposit facility in theory provides an unlimited interest-bearing outlet for excess reserves, the low interest rate offered on such deposits could be expected to prompt payment surplus country banks to either resume lending to payment deficit countries at interest rates they will accept or even to deter unprofitable potential depositors by measures such as by raising bank charges. Either response could be expected to slow the increase in TARGET2 imbalances. Naturally, if the ECB provided a more competitive deposit facility, such as by offering fixed-term deposits at interest rates close to the refinancing rate, this restraint on the TARGET2 imbalances would be removed. Indeed, to meet any further expansion in the payment deficit countries' borrowing at the refinancing rate without easing monetary policy, the ECB would have to borrow money from somewhere. Finally, assuming that the present chronic TARGET2 imbalances are problematic because the obscure subsidy involved is undesirable, how can they be constrained? Clearly, in a monetary union, inter-regional payments cannot simply be suspended. The most suitable measure would be to withdraw, perhaps in stages, the borrowing subsidy that sustains the imbalances – that is, to bring the ECB's collateral standards in line with those in the market. Thereafter, to avoid a renewed build-up of risk in future, some soft limit on TARGET2 deficits, say as a percentage of national GDP, could be set, beyond which a national government is expected to take some action of its choice to inhibit further increases in its country's deficit. If the burden that this would involve is considered unreasonable for any particular payment deficit country to bear, it would be more appropriate for the rest of the eurozone to explicitly either grant that country's government the money to solve its problem by, for example, recapitalising its banks, or lend that government (more) money at clearly subsidised interest rates, such as via the European Financial Stability Facility. To make the relationship between TARGET2 payments and the adjustment of banks' usage of ECB refinancing operations clearer, a numerical example of the changes in the balance sheets of the institutions involved may be helpful. 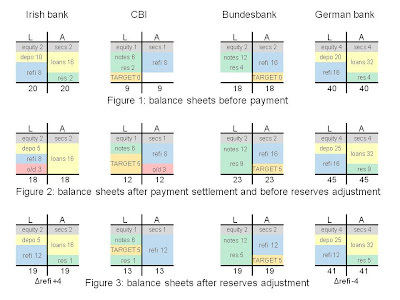 Continuing with the example of an Irish-German interbank payment motivated by either a tractor purchase or deposit flight, Figures 1 to 3 below show the balance sheets of the Irish payer bank, the Central Bank of Ireland (CBI), the German payee bank and the Bundesbank at various stages in the process. Figure 1 shows the situation before the payment is made, Figure 2 shows the effect of the payment alone and Figure 3 shows the balance sheets after the banks have adjusted their reserves position to accommodate the payment. In practice, since day-to-day overdrafts at the central bank are not normally permitted, banks would adjust their reserve position at the same time or even in anticipation of the payment being processed, so Figure 2 is somewhat hypothetical, except perhaps briefly intra-day. The figures in this stylised example may be taken to be in some notional monetary unit like billions of euros. The German bank and central bank are, in balance sheet terms, about twice the size of the Irish bank and central bank. In the example, the interbank payment represents half of the existing stock of deposits held at the Irish bank. For simplicity, it is assumed that no TARGET2 balances exist before the payment is made. Both private sector banks and central banks have some equity which is invested entirely in securities which could be used as loan collateral as necessary. The only type of monetary asset held by central banks is refinancing loans to the banks. Although banknotes may have originally entered circulation by being purchased by the banks to meet customer withdrawals from their deposits, and were paid for at the time out of the banks' reserves borrowed from the central bank, it is assumed that all banknotes are now held by the public. The banks are subject to a reserve requirement of 20% of their deposits. In case it is not obvious, "secs" is securities, "depo" is deposits, "refi" is ECB refinancing loans, "res" is reserves and "o/d" is an overdraft in a bank's current account at the central bank. On 16 November, in response to a comment I made on Olaf Storbeck's Economics Intelligence blog, commenter umarmung asked why I believe that Greece could remain in the eurozone after defaulting on its government debt, and whether banknotes can provide an unrestricted channel for capital flight, as suggested in an FTalphaville post. Since my answer became quite long as I considered it, and since it may interest others who might not read the comments, I include it here as an addendum, rather than in the comments. Thanks for your appreciation and good questions, umarmung. Sorry to be so slow to reply to your comment. I needed to re-read the information on the inter-regional settlement and banknote management arrangements in the eurozone before I could have confidence in my opinion. The reason why I say that a eurozone member country which defaults on, or more realistically, restructures its government debt need not give up the euro is that such a credit event does not necessarily disrupt that country's participation in the euro payment system, including inter-district settlement via TARGET2. As described in my post, any change in a country's TARGET2 balance is matched by an incipient change in the reserves liability position on its central bank's balance sheet (Figure 2 in the post). For private sector banks, reserves are an asset, which banks collectively obtain from their national central bank by selling debt (ie borrowing) secured by pledging a sufficient amount of eligible collateral to make that debt effectively credit-risk-free. It follows that TARGET2 balances are credit-risk-free. For example, if trade drains euros from Greek banks to German banks, the TARGET2 liability incurred by the Bank of Greece displaces some of its reserves liability, but the assets exchanged for the displaced reserves remain. As long as the ability of a country's banks to find sufficient eligible collateral to obtain reserves as needed is not impaired by their government's default, that country can remain a fully functioning member of the eurozone. In principle, a eurozone government default need not threaten its country's membership of the eurozone much more than the bankruptcy of one its largest private sector companies. In practice, however, because of the home bias of EU banks' government bond holdings, especially in the peripheral eurozone countries most at risk of default, a government default is likely to substantially depreciate, if not wipe out, the value of the collateral that its country's banks normally provide for central bank loans. Nevertheless, it may still be possible for the country's banks to carry on making euro payments. If a bank has sufficient capital to cover the loss on its government bond holdings, it may be able to supply supplementary collateral to top up the cover for its loans from the central bank. If the bank cannot provide sufficient new collateral, and cannot repay its loans from the central bank, the central bank is supposed to be able to liquidate the collateral already given by the bank to recover what it owes. Unfortunately though, the ECB's failure to tighten collateral standards and haircuts enough to reflect the true risk of eurozone government defaults means that the central bank is likely to suffer a credit loss in the event of bank failures triggered by a government default. This loss is shared by all the eurozone members in proportion to their capital key, but since the loss is then a bygone, there is no reason why the defaulting country's surviving banks should not continue to use the euro. Government defaults tend to be selective such that the government concerned keeps making some priority payments, and unlike companies, bankrupt governments are not liquidated, so that, if a defaulting government is determined that its country should remain in the eurozone, it may nevertheless be able to find the resources – eg by using its gold and foreign exchange reserves – to recapitalise its banks to allow them to replenish their stock of eligible collateral if necessary. Of course if, regardless of such mechanisms, depositors do associate government default with withdrawal from the eurozone and the introduction of a weaker national currency, a growing likelihood of default can be expected to prompt capital flight from nominal assets like bank deposits. In that case, the banks have to find sufficient collateral to allow departing depositors to be paid off as long as the run lasts. How much money is required to ride out this run depends on the stock of bank deposits, the proportion of them which are demand or maturing deposits, and how long the run persists. Naturally, if the banks run out of sufficient eligible collateral and even the government cannot provide more, then in effect, the whole country, and not just its government, is bankrupt. Even then, the country could continue using the euro with exchange controls that restricted the value of outgoing euro payments to no more than the value of incoming payments. I think the issue of banknotes is a red herring. 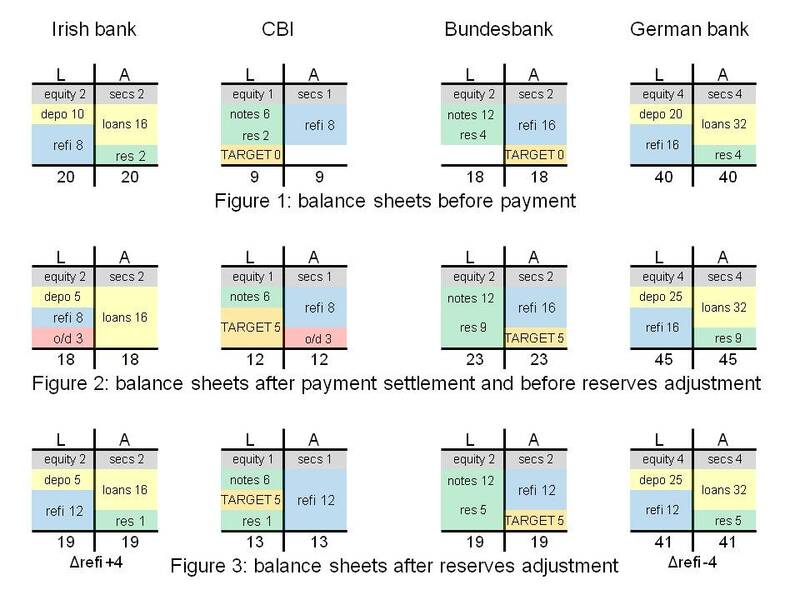 As Clemens Jobst describes in the VoxEU column mentioned by lostgen above on 22 July at 01.04, the balance sheet effects of inter-district fund transfer by banknotes are very similar to those of deposit flight cleared through TARGET2. The small difference is that, instead of a TARGET2 liability (assuming no previous TARGET2 balance), the central bank of the country suffering capital flight, say Greece, incurs an extra liability to the eurosystem to add to that country's allocation of eurozone banknote circulation (equal to its capital key multiplied by 0.92 to allow for 8% of the banknote circulation to be allocated to the ECB itself) to reflect the fact that that central bank has issued more than its share of the eurozone's banknotes. Unless these banknotes are paid into commercial banks, and in turn into central banks, elsewhere in the eurozone, an offsetting adjustment – in their case an asset – appears on each of the other eurozone central banks' balance sheets in proportion to their banknote allocation key. If all the banknotes are paid into the banks and then the central bank of one eurozone country, say Germany, and redeemed, the resulting reduction in that country's net banknote issuance means that its central bank acquires the whole of the offsetting claim on the eurosystem on its balance sheet. I certainly think that the idea given in the alphaville post you mention that "Greece could theoretically continue to issue unrestricted amounts of euro banknotes" to effectively sustain eurosystem funding in the face of capital flight is wrong. Just as they lose reserves when making an inter-district payment via TARGET2, banks have to pay in reserves for the banknotes that they draw, and would still need to pledge eligible collateral when borrowing from the Bank of Greece to replenish those reserves. It is of course true that, if the ECB permits the government bonds of a dangerously indebted or even defaulted country to be pledged as collateral in eurosystem money market operations, that country can fund itself effectively without limit via the eurosystem by selling its government bonds to its banks which then borrow from the eurosystem using these bonds as collateral at their national central bank. But this would clearly be an abuse of the eurosystem which the other members would be foolish to allow to progress very far, and could stop by either capping or suspending the acceptability of the offending country's bonds as eligible collateral. Hopefully that explains my remark on Economics Intelligence and answers your questions satisfactorily. Wow, that's quite a post. I only had a very quick view - unfortunately, I don't have the time to really work through it. On brief thought, however: Let's suppose you're right wrt the claim that the ECB subsidises weak banks in the PIGS countires (can't really evaluate this at the moment) - the problem is the collateral accepted by the ECB in its refi operations, not the Target2 operations, isn't it? Sinn, however, argues that the Target2 operations IN THEMSELVES constitute another bailout. Thanks for your comment Olaf. I'm afraid that one does need to work through the mechanism before judging the merits of Sinn's arguments. The changes in a country's banks' use of refinancing follow practically automatically from the changes in its TARGET2 balance – they are two sides of the national central bank balance sheet. I think Sinn understands that, but does not explain it very well, probably because he did not want to write a post as long as mine. My post might be better with a numerical example showing balance sheet changes, but that would make it even longer! It is interesting to consider that regional variations in the use of central bank refinancing could in principle occur in monetary areas with a single central bank. Such a central bank might not publish a regional breakdown of its operations, but I am sure that if one group of banks with a particular type of collateral persistently dominated such a monetary area's OMOs, it would not go unnoticed by the central bank and the other money market participants. Yet I have never heard of this sort of thing happening, I think because in most monetary areas, any relationship between banks' locations and their bond holdings is weak, and because most central banks operate rigorous collateral standards, and would quickly raise the haircut on, or even cease to accept, a particular type of bonds after a deterioration in their creditworthiness. There was another Sinn op-ed on this today - I will forward it to you. Thank you for this excellent article. I don't think Target-2 is the problem. The problem is the relaxation on the quality standard for the collateral. Target-2 is just the symptom that makes it visible. The same issues would arise if only the ECB and no national central banks would exist. "Target-2 is just the symptom that makes it visible". Precisely; a very good choice of words if your native language is German rather than English! But then, looking at your post of June 12th ( http://verlorenegeneration.de/2011/06/12/stealth-bailout-why-sinn-is-only-partially-right-but-things-might-be-even-worse/ ), you had worked this out long before me. I particularly liked your point that the Eurozone shares the risk of Irish borrowing from the Central bank of Ireland. Thanks for the paper. The abstract sounds like there are no good choices for the ECB. I'll certainly read it. The first is a credit risk bailout. This happens for example when NCB assets become riskier than average ECB assets. Such a credit risk bailout is a structural feature of the ECB through the sharing of (the sum of otherwise regional) profit and loss according to capital shares. Strictly speaking, such credit risk does not have to imply corresponding deposit outflows and related TARGET imbalances (I think this is a variation on Olaf’s point). The second is a liquidity risk bailout. This happens for example when commercial bank deposits move from one NCB area to another. Such a liquidity risk bailout is a structural feature of the ECB through the TARGET system. Strictly speaking, such liquidity risk does not necessarily have to imply a prerequisite increase in credit risk. In actual experience, of course the two risks and their bailouts are correlated, since depositors tend to avoid credit risky banks. The distinction is commensurate with the way in which risks are actually analyzed and managed in banking – there is considerable slicing and dicing of risk types. Thanks for your thought-provoking comment JKH. I agree with you on the credit risk bailout, and as I remarked in my reply to lostgen above, I think it is an interesting observation that the whole eurozone is on the hook for losses incurred by CBI lending to Irish banks in the course of ECB OMOs. I am afraid that the ECB went over the edge of a slippery slope when it compromised its collateral rules to avoid making hard political choices, and failed to stop itself before the slope got steeper when it agreed to buy PIGS bonds, as I wrote in my We had to burn the euro to save it post. Axel Weber was right. I am less convinced by the liquidity risk bailout. Yes, monetary union gives the holder of a sight euro deposit in an Irish bank an unconditional right to ask to withdraw their deposit by transferring it to a German bank at par, but I don't think that the Irish bank can make this payment if it does not have the reserves in its CBI account to meet it. Assuming that the Irish bank would have to borrow to raise those reserves, no bailout is provided if the CBI requires the same level of collateral protection as every other lender in the market, and if the CBI is willing to extend its bank an Emergency Liquidity Assistance loan against sub-standard collateral, this is provided at its own risk, so we return to the credit risk bailout. If the Irish bank does not possess sufficient collateral, it has to close its doors, just like a bank subjected to an old-fashioned run in which depositors want currency. The idea that a euro in an Irish bank is worth the same as one in a German bank is a fantasy, just as the idea that a pound in Northern Rock was worth the same as one in HSBC. Only central bank money throughout the eurosystem is truly fungible. I’m referring to the ex post facto, risk inference of a TARGET imbalance. The fact that there is a TARGET imbalance means reserves have in fact cleared from one NCB area to the other. The primary liquidity effect is that TARGET clears inter-NCB flows of their own reserve liabilities. TARGET claims and liabilities are in effect “super-reserve” positions for such liquidity clearing, in a zero requirement super-reserve system. The secondary liquidity effect is that, as a result of TARGET inter-NCB reserve clearing, it is likely (but not certain) that the payer NCB will provide additional reserves to its own area, in the usual way, in order to restore aggregate reserves to their previous level. That reserve injection doesn’t necessarily have to be with the payer commercial bank. Both liquidity effects could be described as ex post fact bailouts of a sort. The first is entirely structural according to the design of the Euro system. The second is somewhat discretionary, but a likely reaction by the NCB with the TARGET deficit position. The incremental credit effect depends on such additional provision of reserves by the payer NCB. If the NCB provides new refinancing against lower quality collateral, credit risk on the consolidated balance sheet of the ECB deteriorates. This could be described as an ex post facto credit risk bailout. The credit risk is for the account of the ECB as a whole, borne via the capital account as opposed to the TARGET account. Ex ante, there will obviously be no TARGET effect if a bank is shut down and payments are no longer allowed from one NCB area to another. In that case, there is no TARGET inference about liquidity and credit bailouts. I still don't see these as eurozone-level liquidity bailout mechanisms, JKH. Regarding your primary liquidity effect: The liquidity in the eurozone payment system was established at the beginning of the eurozone, when the banks contributed acceptable assets to the eurosystem in return for liquid eurosystem reserves. This could have been a private sector initiative in which the banks established their own payment settlement asset. Payment imbalances between arbitrary sets of banks drain liquidity from one to another, and it does not come back to the losing banks unless they pay for it. It so happens that there still is particular interest in national sets of banks, and for that reason the consolidated central bank keeps score of the amount of settlement asset transferred between the national sets since the system was established, but that is all the TARGET2 balances are – a "symptom", as lostgen pithily put it on 9 July. TARGET2 balances sum to zero simply because they did not initially exist rather than because they are some kind of inter-NCB settlement asset with no TARGET2 reserve requirement for the NCBs. There is no liquidity bailout through TARGET2 per se. Your second liquidity effect may be based on a misunderstanding of how eurosystem lender-of-last-resort and monetary policy operations work. If an NCB, on its own initiative, provides reserves to the banks in its own area, which it may do as an Emergency Liquidity Assistance (ELA) loan, this is at its own risk and is effectively a national bailout. It is not a monetary policy operation. ECB OMOs (which are decided on centrally and offered by the NCBs as agents of the ECB) are supposed to respond to the reserves position across the whole eurozone without regard to national area, and in theory should offset any reserves creation by ELA. I still think the eurozone-level bailout derives from the fact that the PIGS banks are allowed to acquire reserves in return for lower quality assets than the other countries' banks (because they tend not to hold such assets). This only represents a liquidity bailout to the extent that this lower quality reflects lesser liquidity. The “zero-requirement system” is an analogy. TARGET clears changes in NCB reserve liabilities in the same way that CBs clear changes in commercial bank deposit liabilities. So it’s analogous to a zero-requirement CB reserve system. Perhaps I do misunderstand Euro system operations. I thought the ELA was the exception to the rule in terms of refinancing operations, and that credit risk on normal operations is for the account of the system as a whole. And I find it curious to believe that normal ECB refinancing policy and operations don’t require NCB specific input and responses in terms of their own specific decisions relating to reserve quantities and interest rate trading conditions in their own particular area. Yes, it's a good analogy, JKH. But, recalling the debate stirred up by Sinn, the key question is, does TARGET2 per se provide a bailout in terms of liquidity? Hopefully, I have convinced you that it does not. I would not describe the ELA as a refinancing operation. I suppose that in theory, if the NCB takes only the same collateral in ELA as ECB OMOs, ELA could be regarded as a way for an NCB to adjust their banks' aggregate reserves position between ECB refinancing operations, but I expect that the main motivation for ELA is that the NCB can choose to lend against collateral that would be unacceptable to the ECB (by the way, FT Alphaville has had particularly good coverage of ELA - see eg http://ftalphaville.ft.com/blog/2011/07/19/626071/inside-irelands-secret-liquidity/ ). No doubt you are right that NCBs consider their own areas when discussing ECB monetary policy, but, given that such a discussion must focus on eurozone-wide indicators like EONIA, I would not expect the NCB of a small country like Ireland to be able to influence ECB monetary policy to suit their country much. So, again, it seems to me that, to the extent that there is a eurozone-level bailout, it is engineered through the lower ECB collateral standards for effectively the PIGS only. The big picture point that I am trying to make here is that, if the ECB had had rigorous collateral standards – say nothing less than AA govvies in big issue sizes only – and refused to compromise them as the PIGS got into trouble, there would have been no bailout and the issue would have come to a head earlier. Instead, this has been another case of kicking the can down the road. Funnily enough lostgen, I had just read that VoxEU post, and was trying to make a comment there when you posted your comment here. Clemens Jobst provides a good explanation, but he also misses the point that it is the effectively nationally differing collateral standards that have generated the trend in the TARGET2 balances, not monetary union per se.
" Although I like your inclusion of banknotes in the analysis, Clemens, I am afraid that you and the articles you cite are missing the reason why Sinn is basically right about the growing TARGET2 balances. The reason is that this growth has been facilitated by effectively subsidised ECB lending to the GIPS banks, which occurs because (1) unlike the market, the ECB is willing to accept GIPS government bonds as loan collateral and (2) such bonds are disproportionately held by GIPS banks. As you know, TARGET2 balances represent the accumulation of cross border payments settled with central bank money. If the ECB set equally rigorous market-based collateral standards for the whole eurozone, TARGET2 balances should follow something like a random walk, because even a national set of banks losing deposits should be indifferent between replenishing their reserves by secured borrowing from its central bank or from the private sector. Such a run would eventually generate a crisis when the banks affected ran out of eligible collateral, prompting some kind of solution, and even a large TARGET2 balance arising in the meantime would not matter, because it would correspond to strongly collateralised loans somewhere in the eurosystem. As it is, however, by accepting lower quality collateral from effectively the GIPS banks only, the ECB has given them a comparative advantage in accessing its refinancing operations. As they lose deposits, consistently the GIPS banks' best option is to replenish their reserves in the refinancing operations, while the banks in the rest of the eurozone, receiving reserves from the GIPS banks without demand from them to borrow reserves back at on acceptable terms, use these reserves to run down their refinancing loans. So, as long as the deposit run continues, the TARGET2 balances will grow remorselessly, until, as Sinn pointed out, the entire "natural" stock of refinancing is loaned to the GIPS banks (and beyond that point if the ECB offers a competitive deposit facility). And, in this case the TARGET2 balances do matter, because, assuming that the private sector is correct to consider the kind of collateral accepted by the ECB as inadequate to protect against the GIPS banks' credit risk, the GIPS TARGET2 deficit represents an inadequately compensated risk to the ECB. Given that TARGET2 balances can reflect subsidised lending to national sets of banks it is not unreasonable that this is either formally approved or else that measures are taken to constrain them. I am afraid that in this context comparison with the US Federal Reserve System is not really appropriate, because it is unlikely that readily identifiable sets of banks there hold such distinct types of loan collateral, and less likely that the Fed might feel politically constrained from downgrading those collateral types. I explain this argument in more detail here: http://reservedplace.blogspot.com/2011/07/right-on-target.html "
Useful post, RE - thank you. The only point I'd add is that the width of the corridor is variable (you wrote that the depo/refi spread is 75bp). OK, Anonymous. I edited the post to make that point clear. I think that the ECB's intention though would be that the width of the corridor changes less frequently than its centre as defined by the refi rate. I just discovered this blog and wanted to express my appreciation. I am interested in monetary economics, but I am just a hobbyist and know little about the nuts and bolts of monetary and banking institutions. Hopefully, your blog might help close, if only by a small amount, that gaping hole in my knowledge. (I followed a link here from your very on-point post over at Nick Rowe's blog). Thanks Lee Kelly; you are welcome. Given your interest, you might like the first half or so of my "Easing understanding" post. The TARGET2 issue was discussed in this month's ECB Monthly Bulletin and elicited a rebuttal this morning from Sinn. This is an extremely well written and informative article and I am glad I took the time to read it all. The diagram update is helpful too. Thank you, RebelEconomist. I also just read your responses on Economics Intelligence about the Target2 debate and ECB involvement. While I completely agree with you that the EI author completely missed the point (though Sinn hardly helps himself either based on the selective quoting), I do wonder about your second post in which you state that there is no reason why Greece could not remain in the EZ even post-default. With regards to the Eurosystem specifically, for example, what about the issue of Euro banknotes and their seniorage which are also part of the TARGET2 system? This is briefly covered in an FT Alphaville article ( http://ftalphaville.ft.com/blog/2011/11/14/745851/some-euro-banknotes-are-more-equal-than-others/ ). In addition, when default is viewed by the market or its citizens as a possible or likely precursor to exit of a currency area, is it not possible that ex-post legal and trade conditions could make it untenable to be considered part of that area without an unlimited risk to other states? Thanks RebelEconomist. What a great post. I am iffy in a couple of places, perhaps this would be resolved if I can actually see the illustration you appended. They are too grainy. Could you make available a higher resolution graphic and put a link here? Thank you. "Consequently, TARGET2 payments from Ireland to Germany have on the whole not been offset by payments of loan capital in the opposite direction, implying a growing Irish TARGET2 liability and a growing German TARGET2 claim." I assume "a growing Irish TARGET2 liability" = the refinancing loans ECB offered and taken up by Irish banks, used to shore up reserves at the ECB, correct? "a growing German TARGET2 claim": I don't understand what the claim is. Could you explain? Thanks for your appreciation and good questions, umarmung. Sorry to be so slow to reply. I needed to re-read the information on the inter-regional settlement and banknote management arrangements in the eurozone before I could have confidence in my opinion. Please see the new addendum to the post for my thoughts. The illustration in the post will get larger if you double click on it, but if that is not clear enough, send me your email address and I will send you the jpeg file. Yes, "a growing Irish TARGET2 liability = the refinancing loans ECB offered and taken up by Irish banks, used to shore up reserves at the ECB" is correct. But remember that this is only true after the Irish banks have adjusted their reserves position via the ECB refinancing operations. The Irish TARGET2 liability exists before that (ie Figure 2 in the post), when it is equal to the drawdown in Irish bank reserves as the outgoing payments are made. Assuming that the net outward payments made by the Irish go to Germany, the German TARGET2 claim is essentially the opposite of the Irish TARGET2 liability. In the process of settling its side of the payments, the Bundesbank credits the German banks with additional reserves (again, Figure 2, before the German banks adjust their reserves position by allowing some of their ECB refinancing loans to roll off), adding to the Bundesbank's liabilities, and acquires a claim on the eurosystem, an asset for the Bundesbank, in the form of a TARGET2 claim. Looks like Josef Ackermann in Davos today shares your view on the TARGET2 claims Buba has on the Greek Central Bank. Thanks for your informative blog. What I do not understand: If the german banks run down their refinancing loans then the target-system would only work as long as the corporate banks are willing to use the deposit facility of the Bundesbank (Or the Bundesbank would have to sell assets). But why do the ECB lowered the interest rate on the deposit facility and even lowered the reserve requirements. What would happen if the interbank confidence restores and the german commercial banks start lending each other instead of putting the deposits in the deposit facility? If I understood you correctly, the arguments of Tornell/Westermann in their recent VOXeu article would be right? When I read the introduction to your post about your agreement with Hans-Werner Sinn’s conclusion, I initially assumed that I would disagree with the rest of your entry, as I have been less than impressed by Sinn’s arguments (and even less those of e.g. Tornell and Westermann). However, I strangely find myself in agreement with nearly everything you’ve written! One of my major quibbles with Sinn is the use of the term “stealth bailout” and his linking it to the Target2-balances. If all Eurosystem operations were conducted centrally with banks holding accounts at the ECB instead of with the NCBs, there would obviously be no Target2-balances, but the loans to banks in periphery countries would be the same. I was therefore happy to see that you focused your argument much more on the ECB’s collateral policies, which are, in a sense, providing a bailout to certain banks since the ECB, as you rightly note, accepts collateral at terms that no market participant would do. So I’m inclined to agree that the ECB’s action have a bailout quality to them – but I wouldn’t necessarily describe it as very stealthy... and I would certainly divorce the discussion of Target2-balances from that of the ECB’s collateral policy. If Sinn had focused on the latter, his arguments would have made a lot more convincing. There is one of your arguments, however, which I do not quite understand, namely your contention that if a “relaxation of the ECB collateral rules marginally eases monetary policy in the payment deficit countries, monetary policy must be marginally tighter elsewhere.” My issue with that statement is that while I understand your logic, I’m just not sure your “one-to-one correspondence” applies in today’s money market. It’s not just the stock, but also the distribution of that reserves matters. You could, for instance, take a stock X from unhealthy banks and give it to healthy banks, and I'm pretty confident money market rates would drop by that transfer in spite of a constant stock. I am sorry that your comment disappeared into spam, but I have now rescued it. Actually, having translated your German as best I can using internet facilities (Bilanzverlängerung=balance sheet expansion; aufblähung der geldmenge=inflating money supply), I don't entirely agree. Cross-border payments via TARGET2 per se do not involve money creation or private sector balance sheet expansion. If the paying bank has excess reserves, its balance sheet will actually contract as it reduces the deposit of the customer making the cross border payment and some of its reserves are extinguished when its national central bank takes on the TARGET2 liability to the payee country central bank. The paying country's national central bank balance sheet will remain the same size as the increase in its TARGET2 liability replaces some reserves. The payee bank balance sheet will increase by an equal and opposite amount as its national central bank credits its reserve account and it in turn credits the payee customer's current account. And its national bank balance sheet will also expand as its reserves liabilities increase and its TARGET2 claims increase. Essentially, cross-border euro payments redistribute the existing stock of base money, with an equal and opposite contraction in the private sector balance sheet of the paying country and an expansion in the payee country. If the paying bank has sufficient collateral, it can, by borrowing from its national central bank in the ECB refinancing operations, readily replenish its reserves, in which case its balance sheet does not contract, while if the payee bank has an existing stock of ECB refinancing loans, it can run these down to absorb excess reserves, in which case its balance sheet does not expand. Actually I don't agree with Ackermann. He is assuming that a Greek government default would include Greece's TARGET2 liability, which is not necessarily correct. In EMU, the national central banks are supposed to be independent of government, so assuming that a defaulting government does not override this independence (which the government certainly would not do if they wanted to remain a member of the eurozone), whether the national central bank defaults on its liabilities depends on how much its assets are depreciated by the government's default, and whether it has sufficient capital to absorb these losses. While it is true that many of the loans made by the Greek central bank are collateralised by Greek government bonds, the losses on these bonds are borne in the first instance by the banks that own them. Some of these banks may be sufficiently well-capitalised to survive their losses and repay the central bank. And even where the losses on their holdings of Greek government bonds do bankrupt the banks and cause the central bank to take possession of the bonds pledged as loan collateral, provided that these bonds have some residual value, and provided that the central bank frequently and realistically marked its loan collateral to market and called for more as required to keep its loans covered, the central bank's losses may be small enough to be absorbed by its own capital. As I explained in my December 9 Addendum to the post, in theory TARGET2 balances are supposed to be credit risk free, because they always correspond to collateralised loans made by national central banks to their banks. Your comment raises an interesting question. Although the national central banks execute ECB money market operations as agents of the ECB, and although monetary income is shared out between the national central banks according to the capital key, it does seem (although I have not read any official confirmation of this) that the resulting asset and liability positions appear on the national central bank balance sheets, which are the legal owners of those positions. It occurs to me therefore, that one response to concerns about TARGET2 balances could be to put all positions arising from ECB monetary policy operations onto the balance sheet, and into clear legal ownership, of the ECB, with the national central banks using these assets and liabilities under a power-of-attorney arrangement. Then, there could be no question of national central banks defaulting on their TARGET2 liability while retaining their secured loan assets. In fact, banks' reserve positions would be debited or credited to reflect payments regardless of whether or not these crossed borders, and TARGET2 balances would no longer exist. The TARGET2 payments system works regardless of whether or not German banks can find an outlet for the reserves that are created by payment inflows, although the deposit rate that German banks offer is likely to depend on how much they can earn on the funds, perhaps even to the point that German banks charge for taking deposits, which of course could be expected to deter some of the inflows. When German banks have paid down their entire stock of refinancing loans, which according to Sinn's most recent and best explanation of his case (which is well worth reading by the way: http://www.cesifo-group.de/portal/page/portal/ifoContent/N/rts/rts-mitarbeiter/IFOMITARBSINNCV/CVSinnPDF/CVSinnPDFAndere/NBER_wp17626_sinn_wollm.pdf ) had already happened by August 2011 (Figure 10 of the paper), each bank has two realistic choices of what to do with additions to their reserves – the unrealistic choice is to simply hold excess reserves (ie in excess of the bank's minimum required holding), which are unremunerated. The first realistic choice is to place the excess reserves in a deposit offered by the Bundesbank on behalf of the ECB, either in a fixed term deposit if these are available (eg http://www.ecb.int/mopo/implement/omo/html/20120021_all.en.html ), or in the standing overnight deposit facility, which at the time of writing, earns 25bps, which is 75bps less than the main refinancing rate. A bank's second realistic choice is to try to lend its excess reserves, by offering loans at a lower rate reflecting its reduced marginal (opportunity) cost of funding. Although this cannot reduce the banking system's stock of reserves, it may succeed in expanding the German banking system's collective balance sheet to the point that the reserves become required reserves. This second choice, however, also requires the existence of extra loan demand at lower interest rates and extra bank capital, both of which are hard to find at the moment. In other words, the cost of reserves does not represent much of a restraint on bank balance sheet expansion at present. The recent lowering of the interest rate on the ECB's standing deposit facility was in line with the cuts in the main refinancing and marginal lending rates, and together are supposed to stimulate bank lending, although given that the cost of reserves is hardly restraining lending, the cuts may have been intended mainly as a gesture. Naturally, if economic confidence improves, loan demand and bank balance sheet expansion can be expected to pick up at present interest rates, although the ECB would probably raise interest rates before this became a substantial inflationary threat. I thought Tornell and Westermann's VoxEU article was poor. In EMU, Bundesbank monetary policy operations are executed on behalf of the ECB, using ECB monetary policy instruments, like refinancing loans, standing facilities and fixed term deposits. The amount of the deposit facilities is essentially unlimited, so, while there may be a sharp drop in the returns available to the German banks when they have paid off all their refinancing loans, there is no quantitative limit of the kind suggested by Tornell and Westermann, and no need for the Bundesbank to start selling its own assets like bunds, let alone gold. I presume that Tornell and Westermann were raising these possibilities to stir up interest in their article. While I agree that Sinn's use of the word "stealth", implying that the eurosystem was deliberately hiding the bailout through TARGET2, was a little sensational, I do think that it was difficult to recognise as a bailout until Sinn brought it to public attention (earlier, as far as I know, than anyone else such as John Whittaker), for which he deserves great credit. Whether a lowering of collateral standards for a subset of reserve borrowers represents an easing of monetary policy is partly a matter of definitions and semantics. If the demand curve for reserves according to the ECB's main refinancing rate (ie with the interest rate on the y-axis and reserves demand on the x-axis) applies with a fixed type of collateral from each particular subset of borrowers, I do think that there is a one-to-one correspondence between the refinancing rate and the stock of reserves, because the total demand for reserves is just the sum of demands from all the subsets. If, however, other things equal, the ECB relaxes the collateral standard for any particular subset of borrowers, then the demand curve for that particular subset, and hence the total demand curve, would be expected to shift outwards / right. If the ECB then raised its interest rate to hold the demand for reserves constant, which could be defined as holding its monetary stance constant, the result would be more demand for reserves in the subset with relaxed collateral standards and less demand elsewhere. Of course, it could be argued that, in the case of Greece, unchanged monetary policy requires the ECB to continue taking Greek government bonds as collateral on unchanged terms despite the fact that Greece has become less creditworthy, but in that case, the ECB refinancing rate is no longer a uniform practically credit-risk-free interest rate for every subset of borrowers. Perhaps the best way of describing the effect of the ECB's policy of continuing to accept Greek government bonds as loan collateral is that it gives Greek banks a comparative advantage in accessing ECB refinancing operations. Can you explain why the Target balances don't add up to zero in the ECB Balance Sheet? In December 2008 the ECB itself had Target claims of about 25 billions as you can see in its annual reports or if you add up the target data for all countrys (you can find the data here on eurocrisismonitor.com from the university of Osnabrück). Yes, I believe I can Steve B. Central banks from several non-eurozone EU countries that presumably expect to enter the euro at some point, presently comprising Poland, Denmark, Latvia, Lithuania, Bulgaria and Romania, are connected to TARGET2 (see here: http://www.ecb.int/paym/t2/about/countries/html/index.en.html ). As they are not yet members of the eurozone, these central banks are not permitted to run negative TARGET2 balances with the eurozone central banks and hence, when these balances are reassigned to the ECB at the end of each day, with the ECB itself (see note 2 on page 35 of the October 2011 ECB Monthly Bulletin: http://www.ecb.int/pub/pdf/mobu/mb201110en.pdf ). Presumably, these non-eurozone TARGET2 participants must transfer funds to cover any potential deficits. They may, however, run a positive TARGET2 balance with the ECB, which they might well choose to do as a safety margin to avoid overdrafts, given that such balances are practically credit-risk-free and remunerated at the ECB refinancing rate. Information on TARGET balances which include the ECB but exclude these non-eurozone countries, like the Osnabruck example you give, therefore show the ECB with an overall TARGET2 liability which is not matched by TARGET2 credit elsewhere in the set of countries included. If the non-eurozone TARGET2 participants were included, however, I think that the TARGET2 balances should add up to zero to within measurement error. - for adressing subjects, that may already have been clarified in later postings of yours or elsewhere in this very widely ramified debate. I did haphazardly read a few blogpostings on the subject while the discussion was raging in 2011, but now I bought Prof. Sinns lates book "Die Target-Falle" (The Target-Trap) with the intention of writing a critical review. This necessity occured to me when reading a extract "So wurden die Euro-Retter erpressbar" on the FAZ-Website (Link for anyone understanding German: http://www.faz.net/aktuell/wirtschaft/europas-schuldenkrise/die-target-falle-so-wurden-die-euro-retter-erpressbar-11917895.html). Strangely enough, Sinn still seems to hold a few misconceptions, even though you would imagine that no stone has been left unturned in this international debate with its broard participation on all levels and some illustrious contributors. The more I dig into it, the more thrilling the whole subject is becoming for me; much more so than any whodunit. But since the subject seems to be complicated even for people that have studied economics, I decided I'd better try to get an overview of the internet-debate, before even starting with Sinn's book. And that's how I came across (via Olaf Storbeck) your present entry. Many reader-commentators have rightfully applauded it, but none of them has give a reason why "that's quite a post". What distinguishes it from pretty much all other approaches is your uncompromising step-by-step analysis of the flows of money etc. Your text doesn't suffer from any gaps, which not only sometimes confuse the readers of other contributions, but also the authors. Not infrequently they seem to jump from abstraction to abstraction, and do get entangled themselves in this maze. So while I already did have a pretty realistic understanding of the whole Target2-question, reading your blogpost has reassured me and put my reasoning on a more secure basis: thanks for that! - Obviously as an intended repatriation of capital 'back home'. - Less obviously, as a crowding-out of German banks from refinancing the Irish by the ECB as an unfair competitor (operated with subsidised interest rates, as you explain very clearly). Allow me to make a few remarks, for discussion or not, on a rather broad range of T2-aspects. Thanks to a reader-commentary by a certain Bernd Klehn (mentioned in another context in my complete blogposting) for this blogpost (http://www.diewunderbareweltderwirtschaft.de/2011/02/bundesbank-erklart-die-338-milliarden.html) I found the article "Liquidate or liquefy?" (http://www.ceps.eu/book/liquidate-or-liquefy) by the well-know economist Daniel Gros. Without mentioning the Target2-mechanism, he gives a good description and demonstrates a keen problem-perception of the mechanisms behind Target2. Highly recommended reading!